Put condensed milk can in a large pot of simmering water for 2.5 hours. Then place in iced water to cool. If you are using Caramel Top 'n Fill, you can skip this step. Place ginger biscuits in shallow patty pans and heat them in a moderate oven for 5 minutes, then push down in pans and mould to pans. Open tin of condensed milk and pipe on biscuits. Sprinkle with a little salt. Place on plate and serve. Nice with whipped cream piped on also. Looks like a nice little treat. These are divine. Now, you can just buy the can of caramel condensed milk product so you can use straight from the can. Simple. I make my caramel with a 1/2 cup unhulled tahini, 3 pitted medjool dates, 1/4 cup hot water and pinch of Himalayan rock salt and often on a base of cashew’s, almonds, dates and cinnamon. Hi. Can anybody tell me where I can purchase a can of condensed milk that is completely sealed. Not the ring pull ones as they explode with the pressure of the heat. 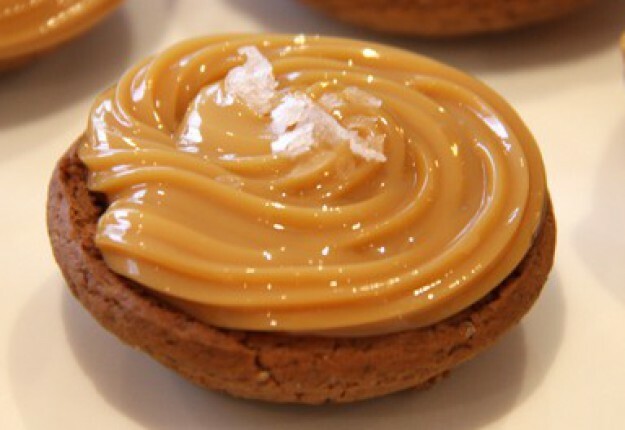 Oh my goodness – love these caramel tarts. Caramel tarts ar to die for! Thanks! how simple and delicious do these sound…great! So simple and yet soooo easy. Thanks for sharing. oh this would be divine!!!! These look yummy! Thanks for sharing. Love these good old fashioned tarts. Yum. They are even better with dark chocolate melted across top of caramel and put in fridge till choc sets. I love caramel made from condensed milk. This is like a big pod! I could add some melted chocolate too.